The molecular mechanisms regulating lymphocyte lineage commitment remain poorly characterized. To explore the role of the IL7R in this process, we generated transgenic mice that express a constitutively active form of STAT5 (STAT5b-CA), a key downstream IL7R effector, throughout lymphocyte development. STAT5b-CA mice exhibit a 40-fold increase in pro-B cells in the thymus. As documented by BrdU labeling studies, this increase is not due to enhanced B cell proliferation. Thymic pro-B cells in STAT5b-CA mice show a modest increase in cell survival (∼4-fold), which correlates with bcl-xL expression. However, bcl-xL transgenic mice do not show increases in thymic B cell numbers. Thus, STAT5-dependent bcl-xL up-regulation and enhanced B cell survival are not sufficient to drive the thymic B cell development observed in STAT5b-CA mice. Importantly, thymic pro-B cells in STAT5b-CA mice are derived from early T cell progenitors (ETPs), suggesting that STAT5 acts by altering ETP lineage commitment. Supporting this hypothesis, STAT5 binds to the pax5 promoter in ETPs from STAT5b-CA mice and induces pax5, a master regulator of B cell development. Conversely, STAT5b-CA mice exhibit a decrease in the DN1b subset of ETPs, demonstrating that STAT5 activation inhibits early T cell differentiation or lineage commitment. On the basis of these findings, we propose that the observed expression of the IL-7R on common lymphoid progenitors, but not ETPs, results in differential STAT5 signaling within these distinct progenitor populations and thus helps ensure appropriate development of B cells and T cells in the bone marrow and thymic environments, respectively. Lymphocyte development involves the differentiation of early lymphoid progenitors (ELPs)3 into lineage-restricted B cells and T cells (1). This process occurs in a stepwise manner, with ELPs first giving rise to two distinct progenitor subtypes: 1) the early T cell progenitor (ETP) in the thymus and 2) the common lymphoid progenitor (CLP) in the bone marrow (2, 3). The mechanisms by which ETPs and CLPs commit to the T or B cell lineage are largely unknown. However, recent results have identified the transcription factor Pax5 and the receptor Notch1 as master regulators of B and T cell lineage commitment, respectively (4, 5, 6, 7). Specifically, low levels of Notch1 expression can be detected on CD44+CD25− thymocytes (triple negative 1, TN1), a subpopulation that contains the earliest T cell progenitors. Notch1 expression levels increase as these progenitors differentiate into pro-T cells (TN2, CD44+CD25+), an event that correlates with commitment to the T cell lineage (8). Furthermore, Notch1 is required for T cell differentiation since T cell development is abrogated in Notch1-deficient mice; in fact, Notch1 deletion leads to intrathymic B cell development (9, 10, 11). Conversely, a constitutively active form of Notch1 results in T cell development in the bone marrow and essentially ablates B cell differentiation (12, 13). Thus, Notch1 signaling is both necessary and sufficient to commit early lymphoid progenitors to the T cell lineage. In contrast to T cell development, pro-B cell development is regulated by a set of transcription factors called early B cell factor (EBF) and Pax5; mice lacking these factors show specific defects in pro-B cell differentiation (14). Commitment to the B cell lineage is completed at the CD19+ pro-B cell stage (15). Pax5 appears to play a particularly important role in this process, because pro-B cells from pax5−/− mice retain a great deal of lineage plasticity. For example, pax5−/− pro-B cells are able to differentiate into a variety of other cell types including T cells, myeloid cells, and erythrocytes (4). In contrast, forced expression of Pax5 in T cell progenitors alters T cell development and results in the generation of CD19-expressing thymocytes (16). These studies demonstrate that up-regulation of pax5 gene expression in early lymphocyte progenitor cells represses differentiation toward other cell fates and thereby promotes development toward the B cell fate (4, 17). Although Notch1 and Pax5 play essential roles in governing lymphocyte development and lineage commitment, the molecular mechanisms that regulate expression of these factors are not well characterized. One intriguing possibility is that cytokine receptors may play an important role in this process. A key cytokine receptor required for both early B and T cell development is the IL7R (18). IL7R−/− mice show a profound block in thymocyte development at the pro-T cell stage (TN2 → TN3), resulting in a 10- to 100-fold reduction in total thymocyte numbers (18). B cell differentiation is blocked at an even earlier stage, corresponding to the CLP to pro-B cell transition (Hardy fraction A) (18, 19). Interestingly, this correlates with expression of the IL7R, which can be observed on CLPs but not on ETPs (2), thereby illustrating a potentially important difference in B vs T cell lineage commitment. To determine whether the IL7R plays a differential role in B vs T cell lineage commitment, we examined the molecular mechanisms by which this receptor regulates early lymphocyte development. We currently know that the IL7R activates a number of downstream signaling pathways, including those for PI3K, STAT3, STAT5, and possibly Ras (20, 21, 22). To identify the role that STAT5 plays in IL7R-dependent lymphocyte development, we generated transgenic mice expressing a constitutively active form of STAT5 (STAT5b-CA). Using these mice, we have recently shown that STAT5 activation is sufficient to drive IL7R-dependent B cell development (23). Specifically, crossing the STAT5b-CA transgene onto an IL7R-deficient background largely restores pro-B, immature B, and mature B cell populations. Thus, IL7R-dependent STAT5 activation plays a key role in directing B cell development. More recently, we have examined the role of STAT5 activation in lymphocyte lineage commitment. We find that STAT5 activation leads to the surprising development of B cells in the thymus. Specifically, STAT5 activation results in the induction of pax5 and bcl-xL in ETPs and thereby redirects these cells down the B cell lineage. Based on our findings and the absence of IL7R expression on ETPs, we propose a model in which T vs B cell lineage choice is dictated by a competition between Notch1 and STAT5 activation. STAT5b-CA mice have been previously described (23, 24). All mice used for analysis were between 4 and 12 wk old. Eμ-Bcl-xL transgenic mice were generously provided by Dr. T. Behrens; they have been backcrossed >10 generations onto the C57BL/6 background (25). Mice were housed in specific-pathogen-free facilities at the University of Minnesota; all animal experiments were approved by the University of Minnesota Institutional Animal Care and Use Committee. Bone marrow and thymi were isolated and processed as previously described (26). RBC were removed from the bone marrow samples by ammonium chloride lysis. Cells were then stained with a panel of Abs (listed below) and analyzed on either a FACSCalibur, an LSR II, a FACSVantage DiVa, or a FACSAria (BD Biosciences). Abs directed against the following markers were obtained from eBioscience: CD3 (2C11), CD4 (GK1.5), CD8 (53-6.7), CD11b (M1/70), CD16/32 (93), CD24 (M1/69), CD25 (PC61.5), CD44 (1M7), B220 (RA3-6B2), CD117 (2B8), BP-1 (FG35.4), DX5 (DX5), Gr-1 (RB6-8C5), IgM (1B4B1), and TER119 (TER119). Additional Abs directed against the following cell surface markers were obtained from BD Biosciences: CD19 (MB19-1), CD43 (S7), and anti-γδ TCR (G7). Bone marrow and thymi from littermate control (LMC) and STAT5b-CA mice were isolated and processed as previously described (26). TN1 and TN2 pro-T cells were isolated by first removing lineage-positive cells via magnetic depletion using an AutoMACS (Miltenyi Biotec) and Abs directed against CD3, CD8, TCR-γδ, B220, CD19, DX5, TER119, Gr-1, and CD11b. Lineage-negative (Lin−) cells were then stained with Abs to c-kit, CD44, and CD25 to isolate TN1 (c-kithighCD44+CD25−) and TN2 (c-kithighCD44+CD25+) cells. These populations were sorted on a FACSAria; the purity of sorted populations was ≥94%. ETPs were isolated from the thymi of LMC and STAT5b-CA mice. The thymi were processed and lineage-positive cells were removed via magnetic depletion as described above. Lineage-negative cells were then stained with Abs to CD44, CD25, IL7R, and c-kit to isolate ETPs (CD44+CD25−c-kithighIL7R−/low). These populations were sorted on a FACSAria; the purity of sorted populations was ≥95%. CD19+B220+ B cells were isolated from the thymi and bone marrow of LMC and STAT5b-CA mice. Lineage-positive cells were removed via magnetic depletion using an AutoMACS (Miltenyi Biotec) and Abs directed against CD3, CD8, TCR-γδ, CD11b, DX5, Gr-1, and TER119. Lineage-negative cells were then stained with B220 and CD19 to isolate CD19+B220+ cells. These populations were sorted on a FACSAria; the purity of sorted populations was >99%. Genomic DNA was isolated from thymus- and bone marrow-derived B220+CD19+ B cells from LMC and STAT5b-CA mice using a DNEasy Tissue kit (Qiagen). Twenty-five thousand cell equivalents were then used in PCR assays to analyze TCR β gene rearrangements (due to the paucity of thymic B cells in LMC mice only 12,500 cell equivalents were used in those PCR assays; this accounts for the reduced intensity of both the Dβ1Jβ1 germline band as well as the hypoxanthine phosphoribosyltransferase (HPRT) control band). 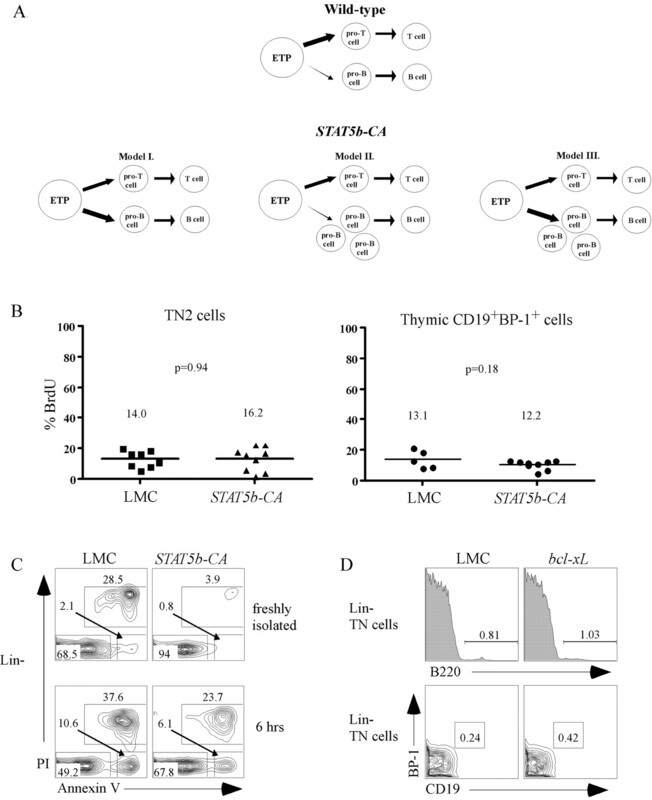 For a more accurate comparison, TCR Dβ1Jβ1 and TCR Dβ2Jβ2 rearrangements from STAT5b-CA thymic B cells were also compared with bona fide LMC ETPs. The PCR assays for TCR Dβ1Jβ1, Dβ2Jβ2, and Vβ8 → DJβ2 gene rearrangements have been previously described (27, 28). All PCR products were fractionated on a 1% agarose gel and subsequently visualized by ethidium bromide staining. To normalize for loading differences between samples, genomic DNA from each sample was amplified using a HPRT PCR assay as previously described (23). The PCR products were fractionated on a 1% agarose gel, transferred to a nylon membrane, and blotted with a HPRT probe as previously described (23). The results from the Southern blots were quantitated on a phosphor imager (Amersham Biosciences). BrdU assays were conducted according to the manufacturer’s instructions (BD Biosciences). Briefly, mice were injected i.p. with 2 mg of BrdU in PBS. One hour postinjection, thymi and bone marrow were isolated and processed as described above. Lineage-positive cells were removed via magnetic depletion on an AutoMACS using Abs against CD3, CD8, TCR-γδ, DX5, CD11b, Gr-1, and TER119. Lineage-negative cells from the thymus were then stained with Abs against CD44, CD25, c-kit, B220, and CD19 to identify developing T cells. In addition, lineage-depleted thymocytes were stained with markers against BP-1, B220, and CD19 to identify developing B cells. The same staining protocol was conducted on lineage-depleted cells from the bone marrow. Intracellular staining was then conducted for BrdU (BD Biosciences). Cells were fixed with BD Cytofix/Cytoperm buffer, washed, and permeabilized with BD Cytoperm Plus buffer. Cells were refixed with BD Cytofix/Cytoperm buffer, resuspended in DNase (20 μg/sample), and incubated for 1 h at 37°C. Intracellular staining for BrdU was conducted for 1 h at room temperature. Flow cytometry was conducted on a LSR II (BD Biosciences) to identify BrdU+ cells. Thymi from LMC and STAT5b-CA mice were isolated, processed, and purified as described in the BrdU section above. Dead cells were removed using Lympholyte (Cellgro Mediatech). Purified cells were then stained immediately and analyzed or resuspended in complete DMEM (10% FBS, 1% penicillin/streptomycin, 1% l-glutamine, and 50 μM 2-ME) and incubated at 37°C for 6 h. At each time point, staining was conducted for IgM, B220, Annexin V, and PI according to the manufacturer’s instructions (BD Biosciences). Cells were washed twice with ice-cold PBS and resuspended in binding buffer (0.01 M HEPES (pH 7.4), 0.14 M NaCl, and 2.5 mM CaCl2). Annexin V and PI were used at 2.5 μl/100,000 cells and incubated for 15 min at room temperature. Samples were analyzed by flow cytometry on an LSR II. ChIP assays were conducted according to the manufacturer’s instructions (Upstate Cell Signaling). Briefly, 15,000 TN1s from LMC and STAT5b-CA mice were isolated via sorting on a FACSAria; we were able to obtain more TN2 cells and hence these experiments used 60,000 (LMC) or 20,000 (STAT5b-CA) TN2 cells. These purified cell populations were then used in a ChIP assay. The transcription factors were cross-linked to the DNA and sonicated on a Fisher Sonic Dismembrator (model 60, microtip 2 mm in diameter). An immunoprecipitation assay was conducted using an anti-STAT5 Ab (sc-835; Santa Cruz Biotechnology). The cross-links were reversed by adding 5 M NaCl to the samples and incubating them at 65°C for 4 h. The chromatin was purified via proteinase K digestion followed by phenol/chloroform extraction. PCR was then conducted using primers that spanned the STAT5-binding motif (29) (38 cycles: 94°C for 1 min, 58°C for 1 min, and 72°C for 1 min). Two-fold dilutions were conducted to obtain a titration of each sample. Southern blots were then conducted using an oligonucleotide probe containing the STAT5-binding motif (GACTCCCGGGAATCTACAGGCCACGTTTTCCAATTT; IDT). Experiments were normalized based on total cell equivalents (three experiments) or by carrying out an identical PCR and Southern blot on cell lysates before immunoprecipitation (three experiments). Thymi from LMC and STAT5b-CA mice (4–12 wk old) were isolated and processed to examine DN1a–e thymocyte populations as described by Porritt et al. (30). Lineage-positive cells were removed via magnetic depletion on an AutoMACS using Abs against CD3, CD4, CD8, CD19, B220, TCR-γδ, DX5, CD11b, Gr-1, and TER119. After purification, cells were stained with Abs against CD44 and CD25 to identify DN1 thymocytes, followed by CD24 (HSA) and c-kit to identify DN1a–e populations. Samples were analyzed by flow cytometry on an LSR II flow cytometer. Absolute cell numbers and p values were calculated for each cell population. These results are representative of 5 experiments (16 LMC and 13 STAT5b-CA mice). To examine the role that the STAT5 signaling pathway plays in lymphocyte development, we utilized transgenic mice expressing a constitutively active form of STAT5 (STAT5b-CA) (23)(Fig. 1⇓, A and B). Expression of the STAT5b-CA transgene was verified using real-time RT-PCR. For these experiments, we purified ETP populations (TN1, TN2, and ETPs) via cell sorting from littermate control (LMC) and STAT5b-CA mice. As shown in Fig. 1⇓, C and D, expression of the STAT5b-CA transgene was detected in TN1, TN2, and ETP cells from STAT5b-CA mice; no expression was detected in these populations from LMC mice. Relative expression levels were calculated following normalization to HPRT mRNA levels (Fig. 1⇓, C and D). Although the presence of activated STAT5 can be monitored using Abs that recognize STAT5b phosphorylated on Y699, we were unable to obtain sufficient numbers of pro-T cells to carry out such immunoblotting experiments. However, we have previously documented that the STAT5b-CA transgene continues to be expressed in more mature T and B cell populations (24). In these mature lymphocyte populations, STAT5b-CA mRNA levels precisely paralleled phospho-STAT5 expression (and hence activated STAT5). Thus, STAT5b-CA expression strongly correlates with activation of the STAT5 signaling pathway. Relative expression of the STAT5b-CA transgene. A and B, Construction of the STAT5b-CA transgene. A, Schematic diagram of STAT5b-CA transgene showing the locations of His → Arg and Ser → Phe point mutations. B, Diagram of the STAT5b-CA transgene expression vector. An ∼1-kb genomic DNA fragment containing the Eμ enhancer (shown in black) is inserted into the lck proximal promoter (light stipples) and drives expression in B and T lymphocytes. The human growth hormone gene (dense stipples) provides a source of introns and a polyadenylation sequence. C and D, Thymi from STAT5b-CA and LMC mice were harvested, and TN1, TN2, and ETP cells were isolated by flow cytometry. STAT5b-CA transgene mRNA expression was quantitated using a TaqMan RT-PCR assay. No signal was detected in reactions lacking reverse transcriptase (no reverse transcriptase controls, data not shown). Relative expression values were obtained after normalization using a HPRT TaqMan assay. D, There are essentially equivalent levels of mRNA between the LMC and STAT5b-CA samples. These results are representative of three experiments. Initial characterization of STAT5b-CA mice revealed that there were increased numbers of TN T cells in the thymi of these mice; this increase in TNs correlated with age (Fig. 2⇓A). However, overall thymic cellularity was not significantly different in these mice (LMC 124 × 106±16.6 × 106, STAT5b-CA 117 × 106±47.8 × 106). To more closely characterize this expanded TN population, we gated on TN cells and stained for B220 expression. Interestingly, STAT5b-CA TN cells exhibit a dramatic increase in the percentage of B220-expressing cells relative to LMC mice (27.7% vs 1.7%, respectively, Fig. 2⇓B); this represents a 45-fold increase in thymic B220+ cells (Fig. 2⇓E). However, since B220 is not uniquely expressed by B cells, we further characterized this population by staining with Abs against BP-1 and CD19, markers that are associated with developing pro-B cells. A significant subpopulation of TN cells from STAT5b-CA mice expressed both BP-1 and CD19 (Fig. 2⇓C). In contrast, virtually no CD19+BP-1+ pro-B cells are found in the thymi of LMC mice. This difference corresponds to an ∼40-fold increase in thymic pro-B cells in STAT5b-CA mice (Fig. 2⇓E). In addition, we found that both IgM+ and IgM− cells are present in the TN population from STAT5b-CA mice (Fig. 2⇓D). In contrast, and consistent with previous reports, the few B220+ cells present in LMC mice are predominantly IgM+ B cells (Fig. 2⇓D). These results demonstrate that B cell development is actively ongoing in the thymi of STAT5b-CA mice and suggest that STAT5 signaling alters B vs T cell lineage commitment in the thymus. STAT5 activation results in B cell development in the thymus. Flow cytometry experiments were conducted on LMC and STAT5b-CA mice between 6 and 12 wk of age. A, Thymi from LMC and STAT5b-CA mice were analyzed using markers against CD4 and CD8 at 6 wk (top panels) and 9 wk (bottom panels) of age. These results are representative of 11 LMC and 11 STAT5b-CA mice. B, B220 expression was examined in the thymus by gating on the TN population using markers against CD3, CD4, and CD8 in LMC and STAT5b-CA mice. These results are representative of 11 LMC and 11 STAT5b-CA mice. C, Pro-B cells in the thymi of LMC and STAT5b-CA mice were identified by gating on the TN population, followed by staining for CD19 and BP-1. These results are representative of three LMC and two STAT5b-CA mice. D, Shown are TN, B220+-gated cells (i.e., the B220+ population shown in B) from LMC and STAT5b-CA mice stained with Abs to B220 and IgM. E, Absolute cell numbers were calculated for total B cells (B220+) and pro-B cells (CD19+BP-1+). For the B220+ B cell population, these results are representative of six LMC and four STAT5b-CA mice. The CD19+BP-1+ thymic B cell numbers are representative of three LMC and two STAT5b-CA mice. To determine whether thymic B cells in STAT5b-CA mice are derived from ETPs, as opposed to CLPs from the bone marrow, we examined TCR DβJβ rearrangement patterns. These studies are important to rule out the possibility that thymic B cells in STAT5b-CA mice are 1) derived from CLPs that have aberrantly migrated to the thymus (unlikely but formally possible) or 2) derived from B cells that developed normally from CLPs in the bone marrow and then after maturation in the spleen migrated to the thymus. The TCRβ locus contains two distinct DJ regions: Dβ1Jβ1 and Dβ2Jβ2 (Fig. 3⇓A). Previous studies have shown that ETPs exhibit TCR Dβ1Jβ1, but not Dβ2Jβ2 rearrangements (2). In contrast, bone marrow-derived B cells do not exhibit significant TCR Dβ1Jβ1 or Dβ2Jβ2 gene rearrangements (2). Therefore, we conducted semiquantitative PCR assays that allowed us to examine TCR Dβ1Jβ1 and Dβ2Jβ2 gene rearrangements in sorted B220+CD19+ B cell populations isolated from the thymi and bone marrow of LMC and STAT5b-CA mice. Fig. 3⇓B shows the purity of lineage-depleted B220+CD19+ thymic populations before and after sorting; sorted populations were >99% pure. Genomic DNA was isolated from these cell populations and subjected to PCR amplification to assay for DβJβ gene rearrangements (27). As expected, there were virtually undetectable levels of TCR Dβ1Jβ1 and Dβ2Jβ2 gene rearrangements in bone marrow-derived B cells from LMC and STAT5b-CA mice (Fig. 3⇓C, lanes 3 and 4). In contrast, robust TCR Dβ1Jβ1, but not Dβ2Jβ2 gene rearrangements, are seen in thymic B cells from STAT5b-CA mice (Fig. 3⇓C, lane 2). As a positive control, whole thymocytes from LMC and STAT5b-CA mice were subjected to TCR Dβ1Jβ1 and Dβ2Jβ2 PCR assays. Importantly, both Dβ1Jβ1 and Dβ2Jβ2 gene rearrangements are observed in these populations as previously reported (2)(Fig. 3⇓C, lanes 5 and 6). For a more accurate comparison, TCR Dβ1Jβ1 and TCR Dβ2Jβ2 rearrangements from STAT5b-CA thymic B cells were also compared with LMC ETPs. Our results show that thymic B cells in STAT5b-CA mice exhibit levels of TCR Dβ1Jβ1 rearrangements that are as high or higher than that found in ETPs, suggesting that virtually all thymic B cells in STAT5b-CA mice are derived from the ETP population (Fig. 3⇓D). In addition, we also examined TCR Vβ8 → DJβ2 gene rearrangements in these distinct cell populations. Vβ8 → DJβ2 gene rearrangements were only observed in total thymocyte populations (Fig. 3⇓E). The absence of Dβ2Jβ2 and Vβ8 → DJβ gene rearrangements in STAT5b-CA thymic B cells documents that the presence of Dβ1Jβ1 gene rearrangements in these cells is not due to contamination from thymic T cells. Thus, these results demonstrate that thymic B cells in STAT5b-CA mice are derived from ETPs. TCR Dβ1, but not Dβ2 gene rearrangements are present in STAT5b-CA thymic B cells. A, Diagram of the TCRβ locus. The primers used in the PCR are indicated by arrows. B, B220+CD19+ B cells were isolated by flow cytometry from the thymus and bone marrow of LMC and STAT5b-CA mice. Lineage-positive cells from the thymus and bone marrow of LMC and STAT5b-CA mice were depleted as described in Materials and Methods. Shown are the B220+CD19+ B cell populations derived from the thymi of LMC and STAT5b-CA mice before and after sorting on a FACSAria. C, To examine TCR Dβ1 and Dβ2 gene rearrangements, genomic DNA was isolated from the purified B220+CD19+ cell populations and used in a semiquantitative PCR assay as described in Materials and Methods. The PCR products were fractionated on a 1% agarose gel and visualized by ethidium bromide staining. HPRT served as a loading control to normalize for differences in the amount of input genomic DNA. A Southern blot was conducted for HPRT as described in Materials and Methods. Because of the paucity of thymic B cells in LMC mice, lane 1 contains only one-half as much input genomic DNA as the other lanes; this accounts for the reduced intensity of both the Dβ1Jβ1 germline band as well as the HPRT control band. These results are representative of two experiments. D, TCR Dβ1 and Dβ2 gene rearrangements were examined as described in C; however, comparisons were made between LMC ETPs and STAT5b-CA thymic B cells; LMC total thymocytes were included as a positive control to show appropriate TCR Dβ1 and Dβ2 gene rearrangements. Two-fold dilutions were conducted, and the PCR products were fractionated on a 1% agarose gel. Both TCR Dβ1 and Dβ2 gene rearrangements and HPRT levels were visualized by ethidium bromide staining. E, Two-fold dilutions of genomic DNA from the same cell populations as in C were used in PCR assays to monitor Vβ8 → DJβ2 gene rearrangements. PCR were conducted using primers 5′ of Vβ8 and 3′ of Jβ2 genes. PCR products were fractionated on a 2% agarose gel and visualized by ethidium bromide staining. A representative example of two experiments is shown. All experiments mentioned above included pooled genomic DNA from three or more STAT5b-CA and LMC mice, respectively. During T cell development, ETPs have been shown to give rise predominantly to T cells in the thymus (2)(Fig. 4⇓A). Although ETPs can be induced to give rise to B cells under artificial circumstances, this occurs, if at all, with very low efficiency in the thymus (2). To determine the mechanism responsible for directing B cell development in the thymi of the STAT5b-CA mice, we considered three alternative models. Enhanced B cell development in the thymus of STAT5b-CA mice could be due entirely to altered lineage commitment in ETPs favoring B cell differentiation (model I). Alternatively, our results could reflect increased proliferation or enhanced survival of a rare ETP-derived B cell population in the thymi of the STAT5b-CA mice (model II). Finally, our findings may result from a combination of both altered lineage commitment and increased B cell survival/proliferation (model III). STAT5b-CA thymic B cells exhibit enhanced survival but not proliferation. A, Models differentiating between lineage commitment (model I), increased proliferation and/or survival (model II), or a combination of the two (model III) are depicted. See text for details. B, TN2 pro-T cells (CD44+CD25+c-kit+) and thymic B cells (CD19+BP-1+) were assayed for proliferation by monitoring BrdU incorporation. Results shown are derived from three independent experiments. C, Thymic pro-B and pre-B cell survival was analyzed in freshly isolated cells and those that were placed in culture for 6 h after purification from LMC and STAT5b-CA mice. Specifically, thymic B cells were purified to remove lineage-positive cells (CD3+, CD8+, TCR-γδ+, DX5+, CD11b+, Gr-1+, TER119+). The remaining cells were stained with IgM, B220, Annexin V, and PI to identify live, apoptotic, and dead B cell populations. Results shown are representative of four experiments (each experiment contained pooled cells from two or more STAT5b-CA and LMC mice, respectively). D, LMC and bcl-xL thymi were examined for the presence of developing thymic B cells. Cell surface staining was conducted using markers directed against B220, CD19, BP-1, CD4, CD8, and lineage markers to exclude other cell populations (CD3, CD8, TCR-γδ, DX5, CD11b, Gr-1, and TER119). Shown is a histogram of B220 staining and contour plots of CD19 vs BP-1 staining for LMC and bcl-xL mice (gated on Lin−, TN cells). These results are representative of two experiments (four LMC, five bcl-xL mice). To examine proliferation of thymic B cells, BrdU assays were conducted using purified cell populations from the thymus and bone marrow of LMC and STAT5b-CA mice. As shown in Fig. 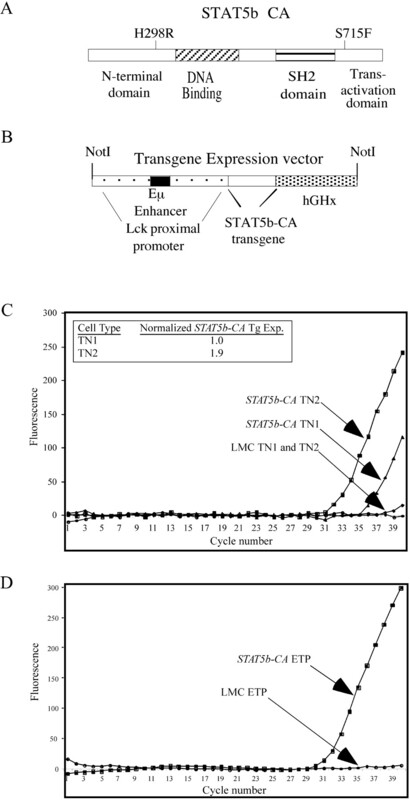 4⇑B, TN2 pro-T cells from LMC and STAT5b-CA mice exhibit similar levels of proliferation. Thus, STAT5 activation does not alter pro-T cell expansion. Likewise, thymic B cells from STAT5b-CA mice do not proliferate more than LMC thymic pro-B cells. Thus, enhanced proliferation is not the mechanism responsible for the increase in intrathymic B cell numbers in STAT5b-CA mice. We next determined whether STAT5b-CA thymic B cells have a survival advantage. To examine this issue, thymocytes were depleted of lineage-positive cells (CD3, CD8, TCR-γδ, DX5, CD11b, Gr-1, and TER119) and stained for surface IgM and B220. Annexin V and PI staining was then analyzed in the B220+IgM− pro- and pre-B cell populations. As is shown in Fig. 4⇑C, the percentage of apoptotic cells (Annexin V+PI−) is decreased in thymic pro-B and pre-B cells from STAT5b-CA mice. Specifically, 1.9 ± 0.7% of freshly isolated thymic B cells from LMC mice were apoptotic; this contrasts with STAT5b-CA thymic B cells, of which only 0.5 ± 0.3% were apoptotic. This corresponds to a 3.8-fold increase (p = 0.005) in pro-B/pre-B cell survival in STAT5b-CA mice. In addition, placing isolated B cells in culture allows for apoptosis to continue without the removal of dead or dying cells by phagocytes. Therefore, we placed isolated thymic B cells in culture to re-examine cell survival. As seen in Fig. 4⇑C, cell death increased following 6 h of culture, although once again STAT5b-CA B cells had a survival advantage. Thymic pro-B cell numbers are increased ∼40-fold in STAT5b-CA mice relative to LMC. Thus, it appeared unlikely that the relatively modest increase in cell survival observed in STAT5b-CA mice accounted for the increase in pro-B cell numbers. However, to formally test this hypothesis, we made use of bcl-xL transgenic mice (Eμ-bcl-xL). In these mice, bcl-xL expression, which is driven by the Eμ enhancer, is observed throughout B cell development (25) and largely overlaps with the expression of our STAT5b-CA transgene in B cells. If increased STAT5-dependent bcl-xL expression was sufficient to account for the enhanced B cell development observed in STAT5b-CA mice, then bcl-xL transgenic mice should exhibit a similar phenotype. However, as shown in Fig. 4⇑D, bcl-xL mice show no significant increase in either total thymic B220+ cells or in CD19+BP-1+ pro-B cells. Thus, STAT5b-dependent bcl-xL induction is clearly not sufficient to drive the enhanced B cell development observed in STAT5b-CA mice. To determine whether STAT5 activation in ETPs could perturb cell fate decisions, we examined whether pax5, a transcription factor associated with B cell lineage commitment, is expressed in T cell progenitor populations in STAT5b-CA mice. To assay for pax5 gene expression, TaqMan RT-PCR assays were conducted on sorted TN1 and TN2 cells from LMC and STAT5b-CA mice. As shown in Fig. 5⇓A, pax5 expression is present in STAT5b-CA TN1 cells. Conversely, LMC TN1 cells or TN2 cells from both LMC and STAT5b-CA mice do not express pax5 (Fig. 5⇓A). We verified that essentially equivalent levels of mRNA were analyzed using a TaqMan assay for HPRT (Fig. 5⇓A, inset). Thus, STAT5 activation is sufficient to induce pax5 gene expression in TN1 cells. T cell progenitors in STAT5b-CA mice show up-regulation of pax5 and bcl-xL and bind to the pax5 gene promoter. 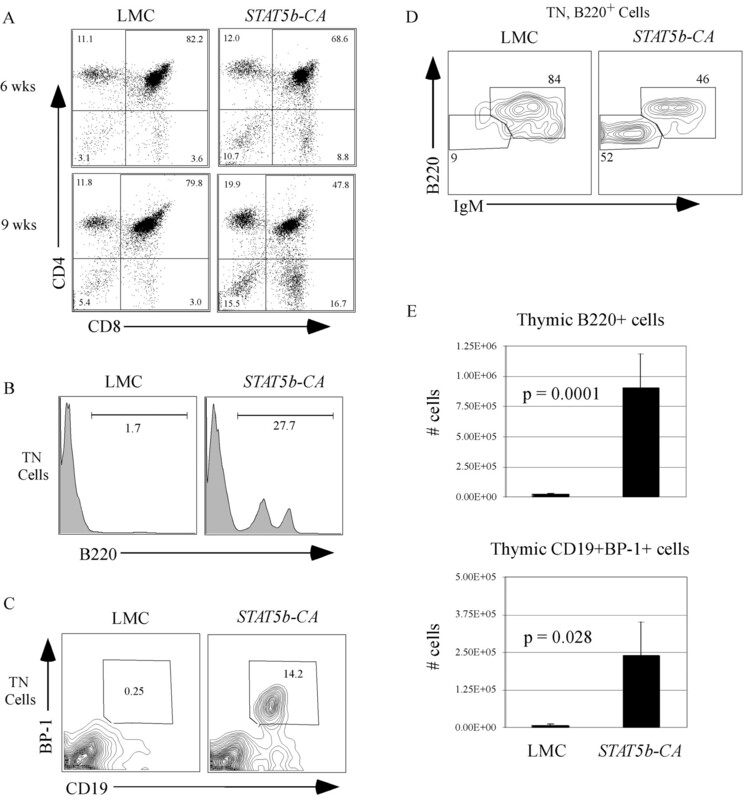 Thymi from STAT5b-CA and LMC mice were harvested and TN1 and TN2 cells were isolated by flow cytometry. A, pax5 gene expression was quantitated using a TaqMan RT-PCR assay. No signal was detected in TN2 cells or in reactions lacking reverse transcriptase (no RT controls). The relative amounts of mRNA were quantitated using a HPRT TaqMan assay. These results are representative of six experiments. B, ETPs from LMC and STAT5b-CA mice were characterized by flow cytometry. Lineage-negative cells were stained with Abs against CD44 and CD25 to isolate TN1 cells (CD44+CD25−). ETPs were identified as c-kithighIL7R−/low. C, ETPs from LMC and STAT5b-CA mice were isolated by flow cytometry and TaqMan RT-PCR assays were conducted to assay for pax5, bcl-xL, and cyclin D2 expression. Relative expression values were obtained after normalization using a HPRT TaqMan assay, and fold expression values were calculated. N.D., Not detected. These results are representative of three experiments. D, STAT5 binds to the pax5 gene promoter. ChIP assays were conducted on isolated TN1 cells and TN2 cells from LMC and STAT5b-CA mice as described in Materials and Methods. Two-fold titrations were conducted on both the immunoprecipitated samples and input samples. Inputs represent PCR conducted on samples before immunoprecipitation. These results are representative of six experiments. Previous studies have demonstrated that TN1 cells are a heterogeneous population that include both ETPs (c-kithighIL7Rlow/−), which give rise to T cells, and non-ETPs (c-kitlow, IL7R+), which do not give rise to T cells (Fig. 5⇑B) (2). To examine whether STAT5 activation changes genes involved in proliferation, survival, or B cell lineage commitment, we conducted real-time RT-PCR assays for cyclin D2, bcl-xL, and pax5 gene expression in ETPs. ETPs were sorted on a FACSAria and subsequently used in TaqMan RT-PCR assays as described in Materials and Methods. Importantly, pax5 is expressed in the STAT5b-CA ETP population (Fig. 5⇑C, top panel), but was never detected in ETP populations from LMC mice. We also examined whether ETPs express different levels of genes involved in cell cycle induction or cell survival such as cyclin D2 or bcl-xL. Cyclin D2 levels are slightly higher in ETPs from LMC vs STAT5b-CA mice (Fig. 5⇑C, bottom panel). This contrasts with bone marrow-derived STAT5b-CA pro-B cells which showed a 7-fold increase in cyclin D2 levels relative to LMC (23). However, similar to bone marrow-derived STAT5b-CA pro-B cells (23), there is a 7-fold increase in bcl-xL mRNA levels in STAT5b-CA ETPs relative to LMC ETPs (Fig. 5⇑C, middle panel). These results are also in agreement with the increase in survival that we observed in STAT5b-CA thymic B cells (Fig. 4⇑C). Thus, STAT5 activation in ETPs results in altered gene expression which promotes cell survival (bcl-xL) and differentiation (pax5) down the B cell lineage. The pax5 RT-PCR results for the TN1 and ETP populations suggest that pro-T cell lineage commitment is altered via STAT5-dependent induction of pax5. If STAT5 is able to directly regulate pax5 transcription, we predict that STAT5 should exhibit binding to the pax5 gene promoter. Importantly, recent results by Hirokawa et al. (29) have identified a STAT5-binding motif in the pax5 gene promoter, and demonstrated that STAT5 binds to this promoter in a BAF pro-B cell line. On the basis of this work, we conducted ChIP assays on c-kithigh, TN1 and TN2 cells sorted from LMC, and STAT5b-CA mice. The presence of the STAT5-binding motif was detected by a PCR, followed by Southern blotting with an oligonucleotide that spans this motif. As shown in Fig. 5⇑D, significant STAT5 binding to the pax5 promoter could be detected in STAT5b-CA, but not in LMC, TN1 cells. Importantly, this increased STAT5 binding does not simply reflect the increase in STAT5 expression levels in STAT5b-CA mice since it was not observed in TN2 cells from either LMC or STAT5b-CA mice (Fig. 5⇑D). These results strongly suggest that STAT5 initiates B cell lineage commitment by directly binding to the pax5 gene promoter and thereby inducing pax5 transcription. Our data strongly suggest that STAT5 activation alters thymocyte lineage commitment by redirecting ETPs toward a B cell fate. One prediction of this hypothesis is that early T cell differentiation should be inhibited in STAT5b-CA mice as well. To examine this issue, we made use of recent findings by Porritt et al. (30) who have demonstrated that DN1 thymocytes can be broken down into five distinct subsets (DN1a–e) by the cell surface markers c-kit and heat stable antigen (HSA). Of these five subsets, DN1a–DN1c would be classified as ETPs (c-kithigh, IL7Rlow/−). Importantly, Porritt et al. (30) have demonstrated that DN1a cells give rise to the DN1b subset, and that these subsets appear to be the only progenitor populations capable of giving rise to larger numbers of mature T cells in the thymus. In contrast, the DN1c subset has both B and T cell developmental potential, although T cell development proceeds inefficiently. Based on these findings, we examined the relative distribution of DN1a–e populations in LMC and STAT5b-CA thymocytes, both by percentage and absolute cell number. For these studies, mature cell lineages were removed by magnetic depletion. The DN1 subsets are identified as lineage negative (CD3, CD4, CD8, B220, CD19, DX5, TCR-γδ, CD11b, Gr-1, and TER119) CD44+CD25− (Fig. 6⇓A). DN1 cells were then further subdivided using c-kit and HSA (CD24) into the previously described DN1a–DN1e subsets. The relative percentages of these cell populations for LMC and STAT5b-CA mice are shown in Fig. 6⇓B; absolute cell numbers were calculated and are shown in Fig. 6⇓C. STAT5b-CA mice exhibit a 3-fold decrease in both DN1a and DN1b ETPs (p = 0.016 and 0.001, respectively) and a corresponding increase in the DN1c subset (5.7×↑, p = 0.016). In contrast, STAT5b-CA mice show no significant changes in the DN1d and DN1e populations. These results document that the development of very early T cell progenitors (DN1a and DN1b) is inhibited upon STAT5 activation. STAT5 activation inhibits early T cell development. Thymi from LMC and STAT5b-CA mice were isolated, processed and purified to deplete lineage positive cells as described in the methods. A. After purification, DN1 populations were identified using markers against CD44 and CD25. Shown is a representative example from 7-wk old LMC and STAT5b-CA mice. B. The DN1 population in 6A was further subdivided using markers against c-kit and HSA (CD24). C. Absolute cell numbers were calculated for DN1a-e (mice ranged from 4 to 12 wk of age). Results shown are from 5 experiments (16 LMC and 13 STAT5b-CA mice, error bars represent S.E.M.). The IL7R plays a key role in both B and T cell development. However, the molecular mechanisms underlying IL7R-dependent lymphocyte differentiation and lineage commitment remain poorly characterized. Interestingly, the IL7R is differentially expressed on ETPs (IL7R−) vs CLPs (IL7R+). Underscoring the potential significance of this differential expression pattern, a recent study has shown that distinct Ets family transcription factors, namely, GA binding protein α and PU.1, regulate expression of the IL7Rα gene in T cells vs B cells, respectively (31). To explore the role of the IL7R on lymphocyte lineage commitment, we focused on the transcription factor STAT5, a downstream target of the IL7R, that has recently been shown to drive both B cell and γδ T cell development (23, 32). Our current studies demonstrate that ectopic STAT5 activation in ETPs induces pax5 gene transcription and results in B cell development in the thymus. Thus, IL7R-dependent STAT5 signaling not only regulates B cell differentiation, but also plays an important role in reinforcing appropriate cell fate decisions during lymphocyte development. Early lymphocyte development involves a binary cell fate decision made by ELPs as they differentiate into either ETPs, which give rise to T cells, or CLPs, which give rise to B cells (or NK cells). Based on the differential expression of the IL7R on ETPs vs CLPs, we hypothesized that IL7R-dependent STAT5 activation functions to regulate lymphocyte lineage commitment. Supporting this hypothesis, we observed a 40-fold increase in developing B cells in the thymi of STAT5b-CA vs LMC mice. Specifically, we detected pro-B cell, immature B cell, and mature B cell subsets in the thymi of STAT5b-CA mice (Fig. 2⇑, C and D, and data not shown). In contrast, although LMC thymi have a very small population of B220+ cells, the majority of these cells are mature B cells characterized by IgM expression (Fig. 2⇑D). This is consistent with previous reports documenting that thymic B cells predominantly exhibit a mature phenotype (33). Thus, these results demonstrate that STAT5b-CA mice exhibit B cell development in the thymus, an organ in which this typically does not occur. We believe that the above findings reflect a role for STAT5 in altering ETP cell fate decisions and not simply enhanced proliferation or survival of rare B cell progenitors. Several pieces of evidence support this hypothesis. First, we have documented that the STAT5b-CA transgene is expressed in ETPs (Fig. 1⇑) and can induce transcription of STAT5 target genes such as bcl-xL (Fig. 5⇑C, middle panel) (34, 35). Second, we directly demonstrate that B cells in the thymus of STAT5b-CA mice are derived from ETPs by making use of TCRDβJβ gene rearrangement patterns. As has been reported for wild-type ETPs, STAT5b-CA thymic B cells exhibit Dβ1Jβ1, but not Dβ2Jβ2 gene rearrangements (2). In contrast, bone marrow-derived B cells from STAT5b-CA mice exhibit undetectable levels of TCR DβJβ gene rearrangements (Fig. 3⇑C). These findings exclude the possibility that the thymic B cells observed in STAT5b-CA mice are derived from rare, infiltrating bone marrow CLPs that undergo expansion in the thymus; rather, they provide evidence that STAT5b-CA thymic B cells are derived from ETPs. Third, we demonstrate that increased intrathymic B cell numbers in STAT5b-CA mice are not due to enhanced proliferation of a rare B cell population (Fig. 4⇑B). In fact, STAT5b-CA ETPs express slightly lower levels of cyclin D2 (Fig. 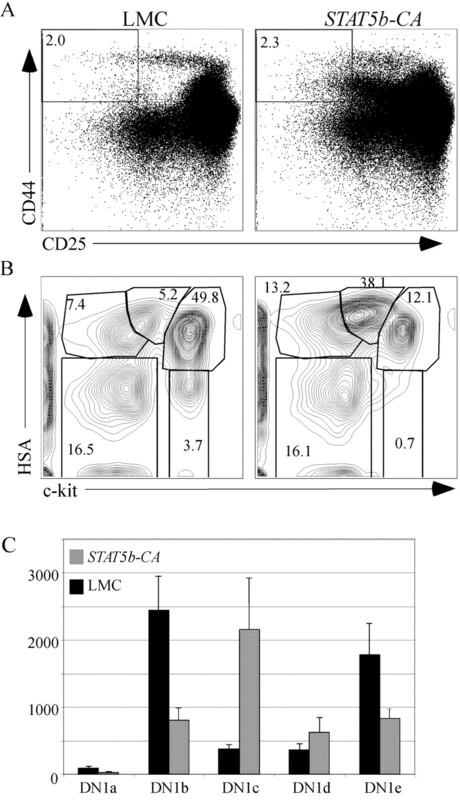 5⇑C), and STAT5b-CA thymic B cells proliferate no better than those of LMC mice (Fig. 4⇑B). Fourth, thymic STAT5b-CA B cells show a modest increase in cell survival (Fig. 4⇑C), which correlates with increased bcl-xL expression in ETPs. However, this is clearly not sufficient to drive the enhanced B cell development observed in STAT5b-CA mice since forced expression of a bcl-xL transgene does not mimic the phenotype observed in STAT5b-CA mice (Fig. 4⇑D). Fifth, the IL7R is expressed on pro-B cells but not ETPs. Hence, if the STAT5-dependent increase in B cell numbers is due to an effect on expansion/survival of pro-B cells rather than altered lineage commitment, then we would predict that IL7 transgenic mice would mimic the phenotype observed in STAT5b-CA mice. In fact, IL7 transgenic mice exhibit, at most, a modest 2-fold increase in total thymic B cells (36) and thus clearly do not recapitulate the dramatic 45-fold expansion of total B cells observed in STAT5b-CA mice. Taken together, these results eliminate the possibility that the pro-B cell expansion observed in STAT5b-CA mice is simply attributable to increased proliferation or enhanced survival of STAT5b-CA thymic B cells. On the basis of our findings, we propose that STAT5b-CA acts to deregulate B vs T cell lineage commitment in ETPs. Specifically, we demonstrate that STAT5b-CA ETPs up-regulate pax5, a transcription factor essential for B cell lineage commitment (Fig. 5⇑C, top panel). Previous studies have shown that forcing pax5 expression in ETPs blocks T cell differentiation (via inhibition of Notch) and results in the production of aberrant CD19-expressing thymocytes (16, 37). Thus, our results strongly suggest that STAT5 induces intrathymic B cell development via induction of pax5 in ETPs. Furthermore, we provide evidence that STAT5 plays a direct role in inducing pax5 transcription. Specifically, we observe that STAT5 binds to a portion of the pax5 promoter that has previously been shown to regulate pax5 expression (Fig. 5⇑D) (29, 38). This finding strongly suggests that STAT5 influences lineage commitment by direct induction of pax5. Finally, our studies also demonstrate that STAT5 activation impairs early T cell development. Specifically, we observed a significant reduction in the DN1b subset of the ETP population (Fig. 6⇑). Taken together, our results support a model in which STAT5 promotes thymic B cell development by both altering lineage commitment in ETPs, via pax5 induction, and by enhancing the survival of thymic pro-B cells, via bcl-xL induction (see Fig. 4⇑A, model III). Although STAT5b-CA mice show remarkable B cell development in the thymus, T cell development is not completely ablated. Hence, STAT5 activation by itself is clearly not sufficient to enforce total lineage diversion. Rather, our results suggest that STAT5 interacts with other factors to promote pax5 gene expression and B cell differentiation. Interestingly, it has been shown that there is a critical binding site for the transcription factor EBF in the pax5 gene promoter (38). Moreover, recent studies by Hirokawa et al. (29) illustrate that STAT5 binds to an overlapping sequence in the pax5 gene promoter. Importantly, this STAT5 binding site is suboptimal (TCCNNNGAA instead of TTCNNNGAA) and most likely requires that STAT5 interact with EBF to bind effectively and induce optimal pax5 gene transcription. Overexpression of STAT5 in EBF-expressing fibroblasts revealed a modest 1.5-fold enhancement of pax5 reporter constructs (29). Although these results suggested that STAT5 and EBF may cooperate to drive pax5 expression in fibroblasts, it was unclear whether the modest synergy observed in those cells would translate into a significant biological effect in B cells in vivo. Importantly, our results suggest that this synergy does indeed occur in vivo and that it has a significant impact on a real biological process, namely, lymphocyte lineage commitment. Our results, taken together with previous findings, suggest the following model for regulation of B and T cell lineage commitment (Fig. 7⇓). Several groups have demonstrated that E2A, a transcriptional regulator of EBF, and low levels of EBF itself, are expressed in ELPs and ETPs (1, 39). Differentiation of ELPs into CLPs results in IL7R up-regulation and allows for STAT5 activation. We propose that activated STAT5 synergizes with low levels of EBF to regulate pax5 transcription and thereby initiate B cell differentiation. Since Pax5 subsequently acts to induce high levels of EBF (40), this establishes a positive feedback loop that then maintains Pax5 expression and B cell differentiation in the absence of further STAT5 signaling. In contrast, differentiation of ELPs into ETPs does not result in IL7R up-regulation; rather, ETPs exhibit up-regulation of Notch1 expression. Based on the high level of conservation of Notch1 and EBF throughout evolution, we suggest that Notch1 represses EBF expression in ETPs, thereby preventing B cell differentiation. For example, Notch1 can repress signaling from EBF homologues in species such as Xenopus to influence neuronal development or in Drosophila to regulate myogenesis (41). In addition, transcription of E2A, an upstream activator of EBF, is inhibited by Notch signaling (12). More recently, work by Sun and colleagues (42) has demonstrated that Notch1 can target E2A for degradation, providing another mechanism by which Notch1 can influence EBF expression. Finally, upon differentiation of ETPs into TN2 pro-T cells, the IL7R is expressed. This allows IL7R-dependent signaling pathways such as PI3K and STAT5 to induce pro-T cell expansion and survival. However, the absence of EBF in these cells prevents STAT5-induced B cell differentiation. This would also explain why we observe STAT5 binding to the pax5 promoter in TN1 cells (which express EBF) but not in TN2 cells (which express higher levels of the STAT5b-CA transgene but do not express EBF). Furthermore, this provides an explanation for why STAT5 activation does not result in complete lineage conversion. Specifically, the STAT5b-CA transgene begins to be expressed in ETPs at about the same time that Notch1 is up-regulated and comes into contact with its ligand in the thymus. Thus, if Notch1 signaling precedes STAT5b-CA expression, this would result in EBF down-regulation and commitment to the T cell lineage; conversely, if STAT5b-CA expression precedes Notch1 signaling, this would result in pax5 induction and B cell lineage commitment. In this sense, early lymphoid progenitors exist in an unstable equilibrium that can be easily perturbed by environmental cues, resulting in either B or T cell commitment. Model of T cell vs B cell lineage commitment. See text for details. Seen in this light, STAT5 does not act as a master regulator of B cell differentiation, but rather as an amplifier that enhances the probability that lymphocyte progenitors will give rise to B lineage cells. Hence, in the bone marrow environment, where Notch ligands are not encountered by early B cell progenitors (43), IL7R-dependent STAT5 activation synergizes with EBF and leads to a very high probability of B cell differentiation. In contrast, in the thymus, where Notch ligands are abundantly expressed and STAT5 signaling is induced only following T cell lineage commitment, the probability of B cell development is drastically reduced. In conclusion, we propose that appropriate IL7R-induced STAT5 signaling reinforces lymphocyte cell fate decisions and ensures that B cell and T cell development are restricted to the bone marrow and thymic environments, respectively. We thank Greg Veltri and Paul Champoux for assistance with flow cytometry and Drs. Kris Hogquist, Tucker LeBien, and Marion Collins for critical review of this manuscript. We thank Drs. Keli Hippen and Tim Behrens for providing Eμ-bcl-xL transgenic mice. ↵1 This work was supported by grants to M.A.F. from the National Institutes of Health (AI05737), the Concern Foundation, the Minnesota Medical Foundation, a Pew Scholar Award, and a Cancer Research Investigator Award. C.A.G. and M.A.B. were partially supported by a gift from the estate of Eli and Dorothy Rosen and Bernard Collins. C.A.G. and M.A.B. are also supported by a National Institutes of Health Training Grant (2T32-AI07313). ↵3 Abbreviations used in this paper: ELP, early lymphoid progenitor; EBF, early B cell factor; ETP, early T cell progenitor; CLP, common lymphoid progenitor; TN, triple negative; ChIP, chromatin immunoprecipitation; PI, propidium iodide; HPRT, hypoxanthine phosphoribosyltransferase; GA binding protein, GABP; LMC, littermate control; HSA, heat stable antigen. Igarashi, H., S. C. Gregory, T. Yokota, N. Sakaguchi, P. W. Kincade. 2002. Transcription from the RAG1 locus marks the earliest lymphocyte progenitors in bone marrow. Immunity 17: 117-130. Allman, D., A. Sambandam, S. Kim, J. P. Miller, A. Pagan, D. Well, A. Meraz, A. Bhandoola. 2003. Thymopoiesis independent of common lymphoid progenitors. Nat. Immunol. 4: 168-174. Kondo, M., I. L. Weissman, K. Akashi. 1997. Identification of clonogenic common lymphoid progenitors in mouse bone marrow. Cell 91: 661-672. Nutt, S. L., B. Heavey, A. G. Rolink, M. Busslinger. 1999. Commitment of the B-lymphoid lineage depends on the transcription factor Pax5. Nature 401: 556-562. Rolink, A. G., S. L. Nutt, F. Melchers, M. Busslinger. 1999. Long-term in vivo reconstitution of T-cell development by Pax5-deficient B-cell progenitors. Nature 401: 603-606. Izon, D. J., J. A. Punt, W. S. Pear. 2002. Deciphering the role of Notch signaling in lymphopoiesis. Curr. Opin. Immunol. 14: 192-199. Huang, E. Y., A. M. Gallegos, S. M. Richards, S. M. Lehar, M. J. Bevan. 2003. Surface expression of Notch1 on thymocytes: correlation with the double-negative to double-positive transition. J. Immunol. 171: 2296-2304. Radtke, F., I. Ferrero, A. Wilson, R. Lees, M. Aguet, H. R. MacDonald. 2000. 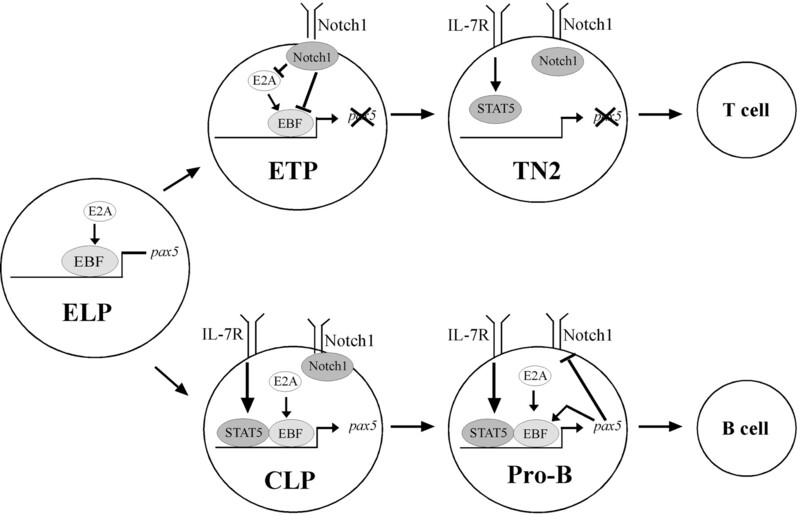 Notch1 deficiency dissociates the intrathymic development of dendritic cells and T cells. J. Exp. Med. 191: 1085-1094. Wilson, A., H. R. MacDonald, F. Radtke. 2001. Notch 1-deficient common lymphoid precursors adopt a B cell fate in the thymus. J. Exp. Med. 194: 1003-1012. Pui, J. C., D. Allman, L. Xu, S. DeRocco, F. G. Karnell, S. Bakkour, J. Y. Lee, T. Kadesch, R. R. Hardy, J. C. Aster, W. S. Pear. 1999. Notch1 expression in early lymphopoiesis influences B versus T lineage determination. Immunity 11: 299-308. De Smedt, M., K. Reynvoet, T. Kerre, T. Taghon, B. Verhasselt, B. Vandekerckhove, G. Leclercq, J. Plum. 2002. Active form of Notch imposes T cell fate in human progenitor cells. J. Immunol. 169: 3021-3029. Busslinger, M.. 2004. Transcriptional control of early B cell development1. Annu. Rev. Immunol. 22: 55-79. Mikkola, I., B. Heavey, M. Horcher, M. Busslinger. 2002. Reversion of B cell commitment upon loss of Pax5 expression. Science 297: 110-113. Soubani, A., C. Cobaleda, M. Schebesta, M. Busslinger. 2002. Pax5 promotes B lymphopoiesis and blocks T cell development by repressing Notch1. Immunity 17: 781-793. Cotta, C. V., Z. Zhang, H. G. Kim, C. A. Klug. 2003. Pax5 determines B- versus T-cell fate and does not block early myeloid-lineage development. Blood 101: 4342-4346. Peschon, J. J., P. J. Morrissey, K. I. Grabstein, F. J. Ramsdell, E. Maraskovsky, B. C. Gliniak, L. S. Park, S. F. Ziegler, D. E. Williams, C. B. Ware, et al 1994. Early lymphocyte expansion is severely impaired in interleukin-7 receptor deficient mice. J. Exp. Med. 180: 1955-1960. Miller, J. P., D. Izon, W. DeMuth, R. Gerstein, A. Bhandoola, D. Allman. 2002. The earliest step in B lineage differentiation from common lymphoid progenitors is critically dependent upon interleukin 7. J. Exp. Med. 196: 705-711. Venkitaraman, A. R., R. J. Cowling. 1994. Interleukin-7 induces the association of phosphatidylinositol 3-kinase with the α chain of the interleukin-7 receptor. Eur. J. Immunol. 24: 2168-2174. Lin, J.-X., T.-S. Migone, M. Tsang, M. Friedmann, J. A. Weatherbee, L. Zhou, A. Yamauchi, E. T. Bloom, J. Mietz, S. John, W. J. Leonard. 1995. The role of shared receptor motifs and common Stat proteins in the generation of cytokine pleiotropy and redundancy by IL-2, IL-4, IL-7, IL-13, and IL-15. Immunity 2: 331-339. Fleming, H. E., C. J. Paige. 2001. Pre-B cell receptor signaling mediates selective response to IL-7 at the pro-B to pre-B cell transition via an ERK/MAP kinase-dependent pathway. Immunity 15: 521-531. Goetz, C. A., I. R. Harmon, J. J. O’Neil, M. A. Burchill, M. A. Farrar. 2004. STAT5 activation underlies IL7 receptor-dependent B cell development. J. Immunol. 172: 4770-4778. Burchill, M. A., C. A. Goetz, M. Prlic, J. J. O’Neil, I. R. Harmon, S. J. Bensinger, L. A. Turka, P. Brennan, S. C. Jameson, M. A. Farrar. 2003. Distinct effects of STAT5 activation on CD4+ and CD8+ T cell homeostasis: development of CD4+CD25+ regulatory T cells versus CD8+ memory T cells. J. Immunol. 171: 5853-5864. Fang, W., D. L. Mueller, C. A. Pennell, J. J. Rivard, Y. S. Li, R. R. Hardy, M. S. Schlissel, T. W. Behrens. 1996. Frequent aberrant immunoglobulin gene rearrangements in pro-B cells revealed by a bcl-xL transgene. Immunity 4: 291-299. Iritani, B. M., K. A. Forbush, M. A. Farrar, R. M. Perlmutter. 1997. Control of B cell development by Ras-mediated activation of Raf. EMBO J. 16: 7019-7031. King, A. G., M. Kondo, D. C. Scherer, I. L. Weissman. 2002. Lineage infidelity in myeloid cells with TCR gene rearrangement: a latent developmental potential of proT cells revealed by ectopic cytokine receptor signaling. Proc. Natl. Acad. Sci. USA 99: 4508-4513. Anderson, S. J., K. M. Abraham, T. Nakayama, A. Singer, R. M. Perlmutter. 1992. Inhibition of T-cell receptor β-chain gene rearrangement by overexpression of the non-receptor protein tyrosine kinase p56lck. EMBO J. 11: 4877-4886. Hirokawa, S., H. Sato, I. Kato, A. Kudo. 2003. EBF-regulating Pax5 transcription is enhanced by STAT5 in the early stage of B cells. Eur. J. Immunol. 33: 1824-1829. Porritt, H. E., L. L. Rumfelt, S. Tabrizifard, T. M. Schmitt, J. C. Zuniga-Pflucker, H. T. Petrie. 2004. Heterogeneity among DN1 prothymocytes reveals multiple progenitors with different capacities to generate T cell and non-T cell lineages. Immunity 20: 735-745. Ye, S. K., K. Maki, T. Kitamura, S. Sunaga, K. Akashi, J. Domen, I. L. Weissman, T. Honjo, K. Ikuta. 1999. 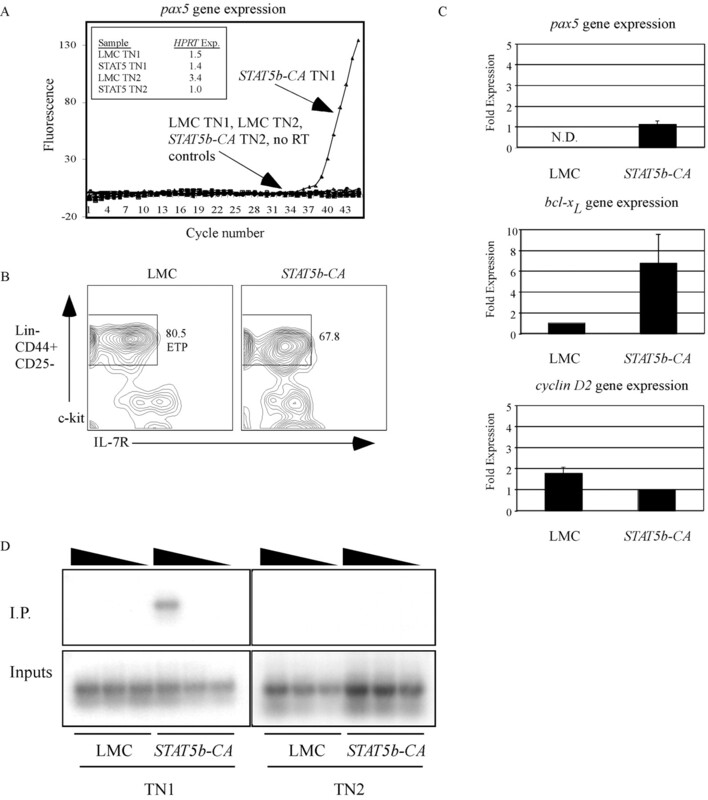 Induction of germline transcription in the TCRγ locus by Stat5: implications for accessibility control by the IL-7 receptor. Immunity 11: 213-223. Ferrero, I., F. Anjuere, P. Martin, G. Martinez del Hoyo, M. L. Fraga, N. Wright, R. Varona, G. Marquez, C. Ardavin. 1999. Functional and phenotypic analysis of thymic B cells: role in the induction of T cell negative selection. Eur. J. Immunol. 29: 1598-1609. Nosaka, T., T. Kawashima, K. Misawa, K. Ikuta, A. L. Mui, T. Kitamura. 1999. STAT5 as a molecular regulator of proliferation, differentiation and apoptosis in hematopoietic cells. EMBO J. 18: 4754-4765. Ceredig, R.. 2002. The ontogeny of B cells in the thymus of normal, CD3ε knockout (KO), RAG-2 KO and IL-7 transgenic mice. Int. Immunol. 14: 87-99. Hsu, L. Y., H. E. Liang, K. Johnson, C. Kang, M. S. Schlissel. 2004. Pax5 activates immunoglobulin heavy chain V to DJ rearrangement in transgenic thymocytes. J. Exp. Med. 199: 825-830. O’Riordan, M., R. Grosschedl. 1999. Coordinate regulation of B cell differentiation by the transcription factors EBF and E2A. Immunity 11: 21-31. Zhang, Z., C. V. Cotta, R. P. Stephan, C. G. deGuzman, C. A. Klug. 2003. Enforced expression of EBF in hematopoietic stem cells restricts lymphopoiesis to the B cell lineage. EMBO J. 22: 4759-4769. Fuxa, M., J. Skok, A. Souabni, G. Salvagiotto, E. Roldan, M. Busslinger. 2004. Pax5 induces V-to-DJ rearrangements and locus contraction of the immunoglobulin heavy-chain gene. Genes Dev. 18: 411-422. Dubois, L., A. Vincent. 2001. The COE–Collier/Olf1/EBF–transcription factors: structural conservation and diversity of developmental functions. Mech. Dev. 108: 3-12. Nie, L., M. Xu, A. Vladimirova, X. H. Sun. 2003. Notch-induced E2A ubiquitination and degradation are controlled by MAP kinase activities. EMBO J. 22: 5780-5792. Tokoyoda, K., T. Egawa, T. Sugiyama, B. I. Choi, T. Nagasawa. 2004. Cellular niches controlling B lymphocyte behavior within bone marrow during development. Immunity 20: 707-718.